Over the last three years, FOLD has established a strong profile on the London art scene with a reputation for accessible shows that promote new art. 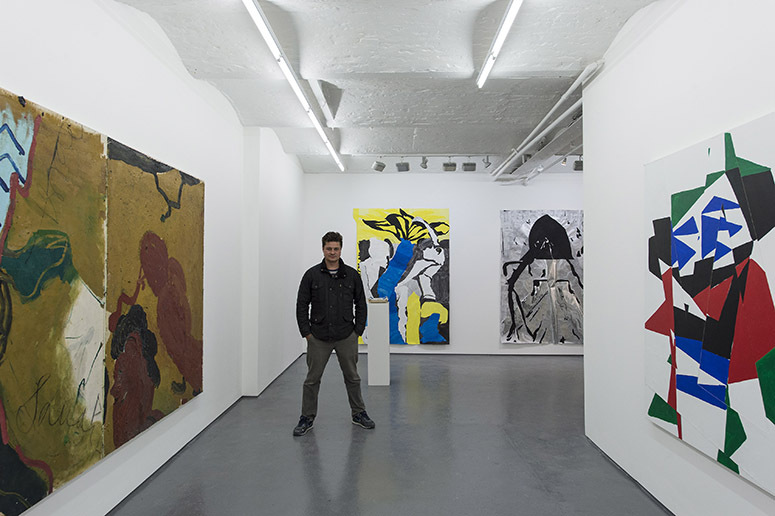 The gallery specializes in producing group exhibitions that bring together UK based and international artists from emerging to mid-career practices. The gallery strives to give the viewer the best opportunity to gain an understanding of the intentions of the artist, whilst viewing the work displayed to the highest possible standards. FOLD currently represents seven artists, including Dominic Beattie, Simon Callery, Dan Davis, Tim Ellis, Valerie Kolakis, Kes Richardson and Finbar Ward. I have met with the Founder and Director, Kim Savage, to discuss gallery’s recent move to Fitzrovia, their beginnings, the new directions in the gallery programme and challenges of running a commercial art venture in the current economic climate. Tell us your story: what is your background, how did you come to this field and how did you set up the gallery? After my degree in painting I got a job at the Saatchi Gallery when they were still based in County Hall on the South Bank. I worked my way up through the company so I was in charge of the storage, shipping and installation of the works. The Saatchi Gallery was a great introduction because at the time there was no bureaucratic hierarchy. When installing, it was quite often just Mr Saatchi and me hanging a particular room. So some of the hangs would be a joint decision between him and I, and every now and again, I could say that it was my suggestion for a layout that would end up being used. That was what really excited me – the practicalities of making a show look its best. Then I got involved with some friends and we set up a small space in Dalston which ran for a short while. After that I decided to set up a project space in Hackney, which was the beginning of FOLD Gallery. In this new space we were running quite an open programme of curated group shows – finding our feet. Then after a few years came the move to Clerkenwell and things got a little bit more commercially orientated so now we are running as a commercial gallery and representing artists here in Fitzrovia. ‘Welcome to the fold’ is an old expression one uses when one is bringing people together – it’s about a group of people that you belong to and share the same beliefs and ideas, which was definitely quite pertinent when we were presenting a group show heavy programme. You have recently moved from Clerkenwell to your new premises. Why did you choose Fitzrovia? We chose to come to Fitzrovia because it seemed like a logical progression from starting in Hackney then moving to Clerkenwell and so we just carried on and moved west to see how we do here. I think clients have this psychological barrier about going east of central in London. I don’t need to move to Mayfair necessarily but it helps to be more central. I hope that in this new location our profile will rise and we can continue to expand the reach of the gallery. The three years we had in Clerkenwell were fantastic and we are eager to see what Fitzrovia has to offer to us. Do you feel that you will benefit from the cluster of galleries that are here already? Yes, but we had that in Clerkenwell, too. It is always good to be around other good galleries. In terms of the programme, what do you feel sets your gallery apart? We have a reputation for quite a cutting edge programme. We don’t have a particular aesthetic that identifies us – it does not bracket us, so we are quite expansive in the way that our programme works. There is definitely a focus on abstraction and people who work closely with material. I think we consistently manage to achieve a really good standard of presenting the work in the space so when you come to see a show; the work always looks its best. Our programme is also more inclusive – we do a lot of curated shows, which bring in artists from different walks of life and put them together. We have artists in their 70s showing alongside artists who are straight out of their BA degrees. How do you decide which artists you are going to represent? How do you meet the artist you show? We go to degree shows, meet them through personal connections etc. All the artists who we represent I have a strong personal connection too, because I think that one of the most important things is sharing a common goal and being able to get on with each other. I don’t want to work with people that are causing friction, so it is a lot easier to have a good relationship personally before you approach the business side. Who do you think is your main audience? Do you have a particular niche? No, I would like to think that everybody from art school, to curators and collectors all value what we do. I don’t think we are aiming at one particular audience. The whole point of the name of the gallery is that it is supposed to be inclusive. I would like to think the programme is that as well. …and is this ethos reflected in your client base? Do you attract clients from all sorts of backgrounds? Absolutely, our client base consists of both small and more prominent private collectors and obviously institutions as well. We would like to expand the reach to everybody and I think that is reflected in our approach. How has your vision and mission changed since you opened? It has certainly developed and refined over the years but I don’t think we have gone through a U-turn or a huge change in direction. It helped a lot that we were not running as a commercial venture for the first three or four years, because it took the pressure off. What are the changes that we are likely to see in terms of your programme this year? You need to watch this space – we are going to have more of an international programme… We are going to have slightly fewer shows in order to give some of the new artists that are working with us a strong focus. We are also planning to commence workshops in the space on the days when it is closed for public viewing. What can you tell us about your current show? Demolition Derby opened on the 14th March is conceptually truly interesting. This inaugural group show, with which we are opening our new space in Fitzrovia, is concerned with re-visitation in various guises. Some artists have re-visited work that has been in the studios or on the wall in their kitchens for many years and they came back to it over and over again, taking it apart, reconstituted it, turning them into something completely different. It is quite interesting because it ties in with the way we are reforming and the way we have looked at how the gallery is presented and reshaping. What are the biggest challenges that you face as a gallerist, working in this particular economic climate? Because of my rather practical background I always found it easy to arrange exhibitions, bring artists together and put on a great show. But I think the biggest challenge for me has been building up a strong client base – that is always an ongoing issue. Running a commercial gallery is a lot of hard work and you have to be very patient and keep plugging away – I think that is the secret to success. How has the economic climate changed since you opened a gallery? We opened in 2008, six months before the recession but because we weren’t commercial it didn’t really affect us then. In the last two years things have got stronger and stronger. I have definitely noticed things have got better over the last 24 months. Some galleries reduce their exhibition programmes at their permanent locations to raise funds for the art fairs they do. Do you feel like you will be doing less shows in the following years? No, we don’t want to compromise on what we do in the gallery. For me the main interest is the programme presented at our permanent premises, so most of the time we are occupied in focusing on that and I think it would be a shame to skip shows here. I appreciate how important art fairs are for meeting new and existing clients and getting our artists out there, and it is something I am considering to do more in the future but we have been very careful about where we exhibit. So far we have done London Art Fair and Art 14. We also did Scope years ago when it first came to London. We are going to look at doing something in continental Europe next. There are so many people dreaming about having their own gallery – do you have any advice for them? Patience. Be patient and don’t give up. Patience and belligerence are the two main things that you need.